The Alberta Energy Regulator (AER) has finalized new regulations for shallow in situ steam-assisted gravity drainage (SAGD) operations. The regulation applies to certain sections of the Athabasca deposit, near the town of Fort McMurray, where the caprock is either eroded or less than 10 meters in thickness. The directive applies to deposits with less than 150 meters of overburden. Directive 086 was drafted as a response to a steam release incident at the Joslyn Creek SAGD facility in 2006, operated by French energy major Total. The facility extracts bitumen from the McMurray Formation, which is capped by a layer of Clearwater shale (caprock). The caprock provides a seal that prevents steam from migrating to the surface. After a 4 year investigation, the AER concluded the release was caused by fractures in the caprock brought on by excessive steam pressures, causing steam to migrate to the surface. Total speculated the failure was caused by localized vertical dilation chimneys, which provided a pathway for steam release to the surface. The caprock contains natural fractures which may have also compromised integrity of the protective layer. The AER ordered Total to lower its maximum steam pressure to 1200 kPag while additional monitoring systems were put in place to evaluate performance of the reservoir. Joslyn Creek is the shallowest SAGD operation in Alberta, where the McMurray formation lies 90 to 105 meters below the surface. The AER temporarily suspended approvals of several SAGD operations in the same area with similar geological formations pending conclusion of its investigation. 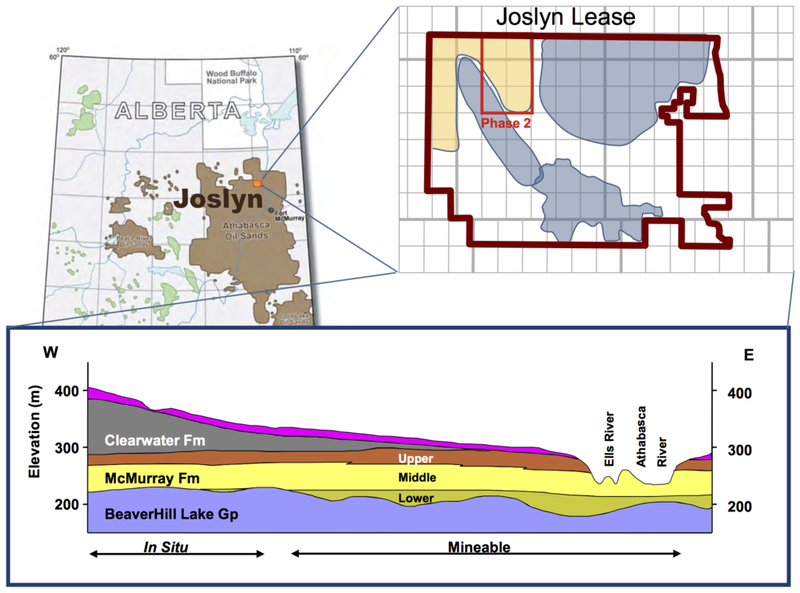 The Joslyn lease was acquired by Total through its purchase of Deer Creek Energy in 2005 for $1.35 billion, which included plans for a mining operation. Total abandoned the SAGD operation in 2010, citing low oil prices and poor economics due to shut-ins that occurred post-incident and the added cost of monitoring. The company has since cancelled all expansion plans and unbooked the bitumen reserves. Directive 086 is intended to protect the integrity of the caprock for the life of the operation, in part by restricting the maximum operating pressure for leases with complex geology. The AER developed the guidelines through collaboration with Alberta Health, Alberta Energy, Alberta Environment and Parks, industry and research experts, the Regional Municipality of Wood Buffalo and indigenous communities. Directive 086 took effective on December 16, 2016.